On Saturday 29th November, Outrigger Laguna Phuket Beach Resort opened their brand new Similan ballroom with our event Black Tie Muay Thai. Around 200 people attended the event to watch 6 spectacular exhibition fights and demonstration matches, including a blindfolded match! Many many thanks toall our sponsors on the night, including the major sponsor Outrigger Laguna Phuket Beach Resort. To view all our wonderful sponsors, click here. A huge thank you must also go to Jessi Cotterill and Max Tiverne for donating their time to producethe beautiful photographs from the night. Please visit our Facebook page toview more photos of the evening. On Saturday, September 13th, Trisara Luxury Resort generously hosted the beautiful 'A Night at the Opera' event in support of Phuket Has Been Good To Us. The sold-out event proved to be a massive success with gorgeous performances from FIVERA and an exciting silent auction that included luxurious escapes to Bali and Myanmar. A Night at the Opera would not have been possible without… Trisara Luxury Resort, Oriental Events, Production by Kritidech, FIVERA, Class Act Media, Live 89.5, Wine Gallery and Wine and Taste. We would also like to thank everyone who kindly donated a silent auction or Mystery Table prize. Click here to view a complete list of sponsors. We would like to extend a huge thank you to Max Tiverne for the beautiful photos. Please visit our Facebook page to view all the photos from the evening. 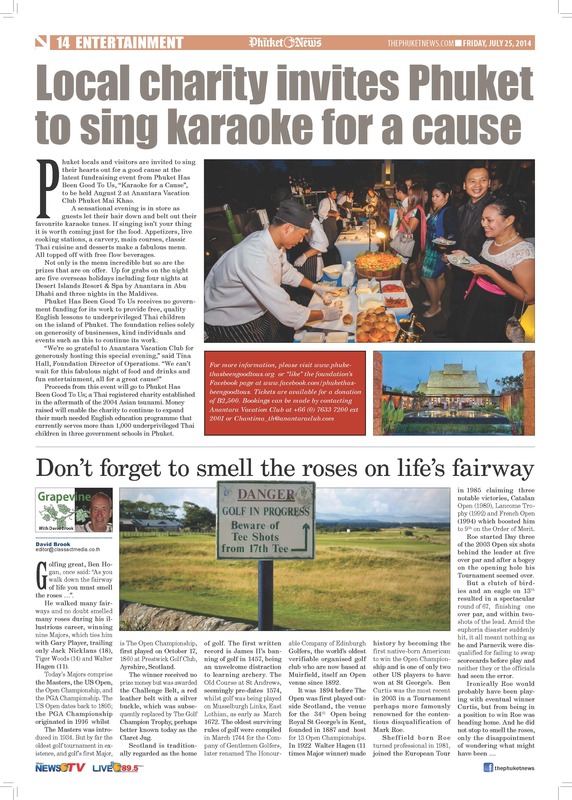 On Saturday, August 2nd, Anantara Vacation Club guests and locals alike sung their hearts out in support of Phuket Has Been Good To Us. The fundraiser proved to be a great success with guests singing everything from Madonna to The Beatles. With some great prizes on offer, guests were able to get some amazing deals on beautiful hotels around the world, including the Maldives and Abu Dhabi. Karaoke for a Cause would not have been possible without... Anantara Vacation Club Phuket Mai Khao, Mr. Lyndon Ellis, Class Act Media, Daniel Billota, DJ Tom the Tank, Khun Chonlatit Jongjit (Mario), Khun Daeng, Mr. Richard Phillips, Wine & Taste, Wine Dee Dee, Wine Gallery and World Class Wine. We would also like to thank everyone who kindly donated a silent auction or live auction prize. Click here for a complete list of sponsors for this event. We would like to extend a huge thank you to Khun Tidarat Thongsiri (Amp) for the wonderful photos. Please visit our Facebook page to view all the photos from the evening. On Friday May 9, Bliss Beach Club hosted our second major fundraising event of 2014, Miami Beach Party. More than 200 beautifully adorned guests enjoyed a night of high fashion, exquisite food and free flow wine, raising more than 750,000 THB for the Foundation. The event was a massive success and demonstrated, yet again, the incredible generosity of the Phuket community. The Miami Beach Party would not have been possible without… Bliss Beach Club, Oriental Events, Production by Kritidech,BB&B, Andaman Wine Club, Worldlennium, Point Yamu by COMO, SALA, Breeze @ Cape Yamu, Lady Pie, Island Bliss, EKA Soundz, Class Act Media, Live 89.5, and The Phuket News. We would also like to thank everyone who kindly donated a raffle, silent auction or live auction prize. Click here for a complete list of sponsors for this event. A huge thank you to Khun Soong, Max Tiverne, JJ from BIS and Four Seasons Info Media Co, Ltd for the beautiful photographs. On Saturday February 8, The Pullman Phuket Arcadia hosted our first major fundraising event of 2014, The Masquerade Party. It was a marvellous night of mystique and masks, as 160 guests enjoyed cocktails, free flow wine, five courses of delicious Venetian cuisine and dancing. The event was a huge success and raised close to 1 million baht for the Foundation, and it was clear that everyone who attended enjoyed themselves and the fantastic evening. The Masquerade Party would not have been possible without… Pullman Phuket Arcadia, Oriental Events, Production by Kritidech, BB&B, Andaman Wine Club, Absolute World Group, World Lennium, Class Act Media, The Phuket News, Novosti Phuket, Live 89.5, Phuket News TV and Phuket Ticketmaster. We would also like to thank everyone who kindly donated a raffle, silent auction or live auction prize. Click here for a complete list of sponsors for this event. Thanks to Max Tiverne and Four Seasons Info Media Co, Ltd for the beautiful photographs. Phuket Has Been Good To Us Foundation works to improve the economic opportunities and life chances of young people, by funding and implementing high quality, practical English language education in government schools on Phuket Island. Get all updates, news, and information about PHBGTU.